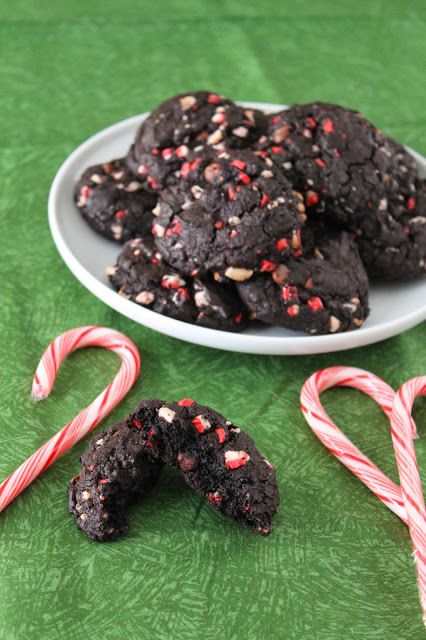 These Double Chocolate Peppermint Cookies are sure to become a family favorite. 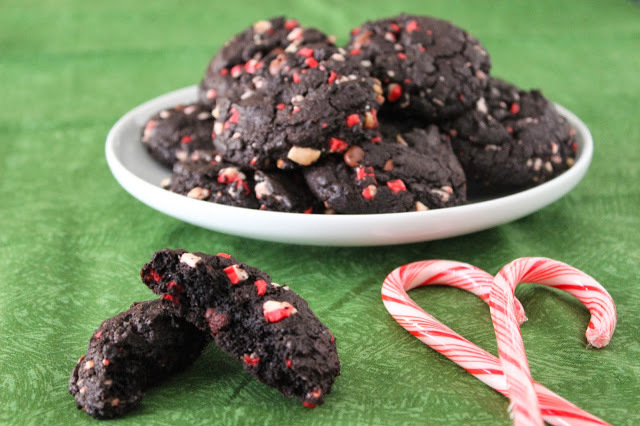 Great chocolate taste with some festive peppermint candies mixed in. I love when you walk through the store and something catches your eye. For me, it happens more often than not, but who’s counting? I saw these Peppermint Baking Chips the other day and they called to me. What is more festive around the Christmas season than baking and candy canes? As luck would have it, there was a great recipe for chocolate cookies on the back of the package and I knew I had to make them. 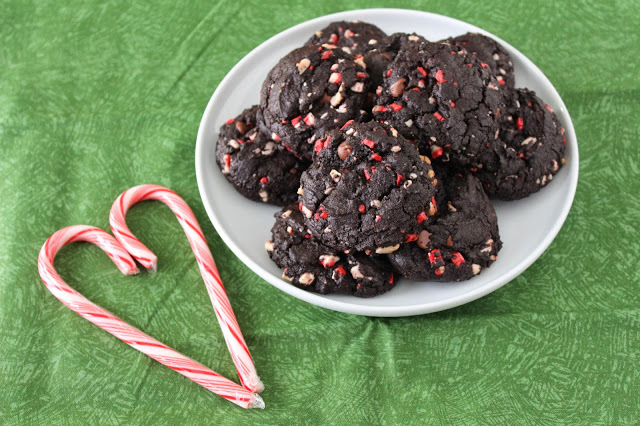 Chocolate and peppermint go so well together, and really, who can resist chocolate cookies? When I opened the oven after they were done baking, the peppermint and chocolate made the whole house smell like Christmas. These cookies are so dark, rich and delicious I had to remind myself to take photos before they got gobbled up. I made a half batch, because there is more peppermint goodness coming and I wanted to make sure I had enough baking chips left. Make sure these cookies are added to your holiday baking list! – Place Butter and Espresso Powder in a small saucepan and melt. Once melted, let cool to room temperature. – Sift together Flour, Cocoa Powder, Baking Soda and Salt. Reserve in a small bowl. – In the bowl of a stand mixer with the paddle attachment, mix room temperature Butter mixture, Brown Sugar, granulated Sugar and Vanilla Extract until combined. – Add in Egg and mix until combined. Gradually add in flour, a little at a time, while on low speed, just until incorporated. 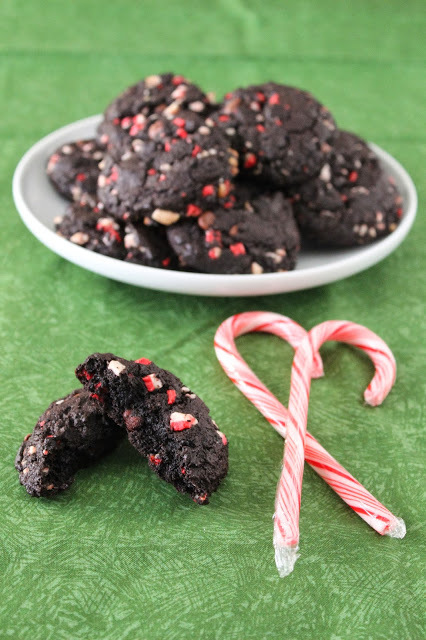 – Add in Peppermint Baking Chips and Chocolate Chips. Mix by hand with a spatula. – Cover with plastic wrap and refrigerate for 10 minutes. – Using a medium-sized cookie scoop, drop onto ungreased cookie sheets and press down slightly on each one. Bake for 10-12 minutes. Let cool for a few minutes on the cookie sheet, then move to a wire rack to cool completely. Enjoy! Disclaimer: I was not compensated or provided anything for this post. All opinions are my own. These sound amazing! I made a similar recipe for the Food Blogger Cookie Swap. I should have kept a dozen for myself! Julianne, they are SO good! So rich and chocolate-y with that peppermint bite.